If you’d like an excellent example of using online video to advance your career and grow your business, look no further than Hector Velazquez. Hector is a mechanic and works as the golf course equipment manager at the Walnut Creek Country Club in South Lyon, Michigan. 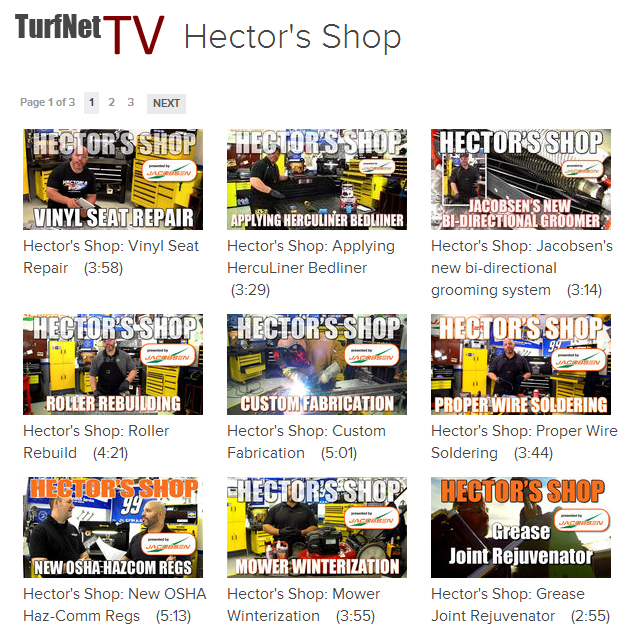 Hector wanted to share his mechanical expertise so began making videos explaining how to repair common problems with lawn care equipment and the other machines he worked on daily that were needed to keep a golf course looking gorgeous. Hector had absolutely zero video production experience. Hector was into lawn mowers, not video cameras. But he knew that online video was an incredible opportunity, so why not? Hector researched online and found this humble blog. 🙂 Not to brag and change the topic to ME, but Hector swears my tutorials were way easier to understand than others he found. I also answered several specific question for Hector via email. I always make it a point to answer questions when readers reach out to me. Like I preach, Hector kept it simple, using talking head videos with close-ups edited in to showcase what he was doing. He edited together a short, catchy animated opening with powerful music. His lighting was bright and diffused, audio clear and crisp. Scripts concise and to-the-point. 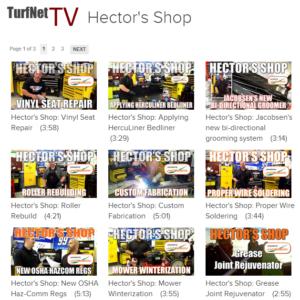 Although simple in style, Hector’s videos were so good that a larger organization, TurfNet, added them to their line up of educational videos, which is quite extensive. They contracted with Hector to produce one video per month. He is now in his third season under that deal. 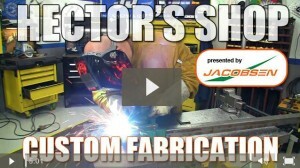 Like other educational video series on Turf Net TV, Hector’s video series is sponsored by Jacobsen, a manufacture of the type of equipment Hector features in his videos. 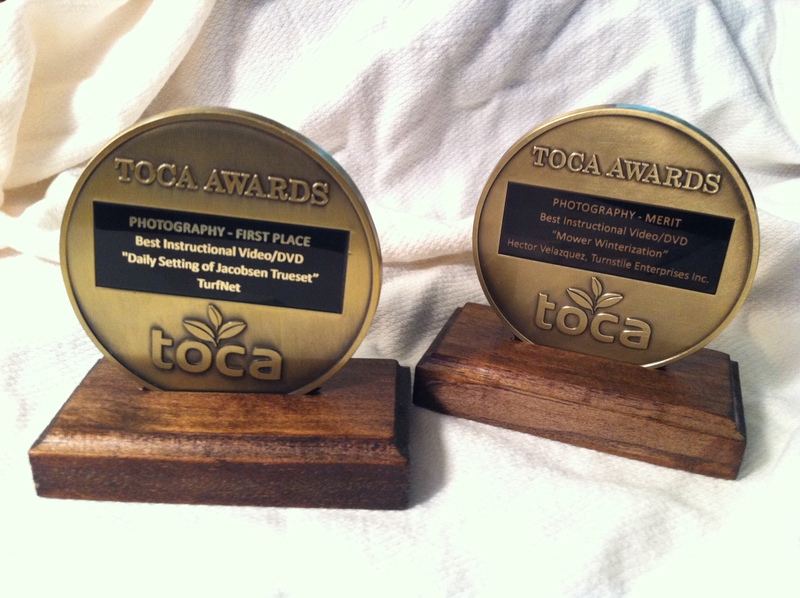 The exposure even lead to Hector winning these two gorgeous trophies for Best Instructional Videos given by an industry trade group, the TOCA Turf and Ornamental Communicators Association. His videos certainly deserved them. I applaud Hector’s willingness to learn a new craft (video) and persist with it until he achieved success. Educational videos like Hector’s are good examples of a hot marketing trend that many companies could implement. Educational videos that train people to use and maintain the equipment (or any product) of the sponsor company is a marketing technique that has blossomed under the opportunity of online video. Personally, I think it’s a great technique and the absolute definition of win-win. Customers have easy access to free instructional videos about their purchases and sponsor companies win customer loyalty and create positive brand awareness. Hector becomes a video star and I get a nice email thanking me for all the great advice on how to make videos. I guess we need to call it a win-win-win-win! Now you get this inspiring blog post….Gosh, we’re all winning here. Most videos follow a formula and that’s ok. If that sounds boring and lacking creativity, not to worry. The creative elements come in the specific details that are added on top of the formula. 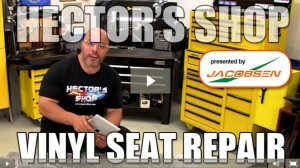 Hector’s videos follow a good and standard format containing quality elements put together in a pleasing way. As his “teacher” I offer these reasons why his videos truly achieve excellence. If you follow these basics, your videos will shine too. Hector is great on camera, speaking clearly, being personable and looking right into the lens. Looks incredibly handsome too! When you watch Hector’s videos, you get no clue that he is experiencing any kind of stage fright, but he is. I know the feeling myself quite well! Overcoming fear of being on camera is a HUGE issue for many people. Kudos to Hector for not letting it stop him. I think he does a great job on camera and comes across as a knowledgeable, personable guy. He succeeds at this because he has obviously practices and has his script down pat. He does not stumble with his words or ramble. His eyes are either fixed on what he is doing or they are looking directly at the viewer. Because one is not enough, here is another video example of Hector’s work. This video show him building a trailer to carry lawn equipment. He got some really awesome close-up in this video. Below this video is a brief interview with Hector. How does your business benefit from using video? I produce “How to Video’s” that help people work on their outdoor power equipment (O.P.E.) e.g. weed eaters, push mowers, riding mowers ect….So how I benefit is in the fact that I am helping someone understand that taking care of their own equipment can be easy! What experience with video did you have when you got started? NONE! ZIP! ZILCH! ZERO! NADA!! LOLl I knew nothing. I got started with a cheap Kodak point and shoot camera that happened to have video option. What things were critical for you to learn about video? I had no experience and even less knowledge. Basic understanding about how video works was critical, then learning about lighting, and more important than all that was audio. I have been to other sites that would “try” to explain this stuff. But, it was not till I found your help video’s that I really “understood”. I was actually understanding and learning and being inspired to learn all I could. Well, being that I was being the camera man, lighting, sound man, editor ect… I was also the “Host” and STAGE FRIGHT was huge, learning to be confident or at least “appear” that way lol. but, dont get me wrong I am still overcoming and I learn more and more. What advice do you have for others who wish to use video in their business? JUST DO IT!! No guts no glory. Do not be afraid to ask the “Stupid” questions, Its ok to “NOT KNOW”. Honestly, know one knows everything but together we can learn anything. Thanks Hector. I especially like that last piece of advice. Here is a link to Hectors personal website with his extensive video library. These are the same videos on the Turf Net site. The library as a whole is truly quite amazing IMHO and I am humbled to have played a small part. Congratulation Hector and thanks to everyone for reading Video Production Tips!